The air was cool, skies gray and winds brisk; typical summer weather pattern for Richmond. Gardeners’ Guild teams set up tents, tables; chairs and before 8am the barbecue was grilling chicken and beef samples for the early taste testers. 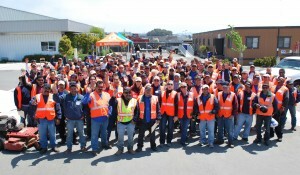 This wasn’t just any company picnic – it was Gardeners’ Guild’s annual Safety Jamboree. It is an opportunity to gather all of us together on site to share food, conversation, and laughter and to remind each other of the importance of Safety. The program started with a delicious lunch of barbecued chicken, beef tortillas, salsa, rice beans, potato salad. Next we broke off into small groups to discuss safety goals for the year and how to communicate those goals. 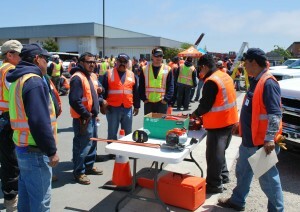 The main portion of the jamboree consisted of training on safe usage of equipment for interior and exterior maintenance; irrigation and construction. Operations Manager, Andrew Guliaeff has a keen eye and a good camera. His candid shots of our staff are the best and this year he also captured a memorable group photo.